At CÉLINE the products are central to everything and speak for themselves. Ready to wear, leather goods, accessories and shoes: each item is crafted to be beautiful and practical, without artifice, in tune with the everyday lives of the women for whom it is designed. CÉLINE’s focus is on “less but excellent”. Rooted in the present, CÉLINE writes its history day after day: exploration, creative energy and committed choices lie at the heart of its culture. The brand’s major characteristics are sophisticated materials, a passion for detail and timeless modernity. Clean. Elegant. Comfortable. The looks by CÉLINE are bound to make you feel confident and chic. Designed for the modern woman, the High Waisted Trouser Wool Grain de Poudre is functional and versatile—able to be worn at any occasion whether it be a dressy event or casual lunch. Crafted with 100% Calfskin and stunning silver hardware, the CÉLINE Small Big Bag with Long Strap is both functional and stylish. A sleek bag for any look. Clean and elegant, the Gathered Moccasin Flat is the ideal shoe for the modern woman. 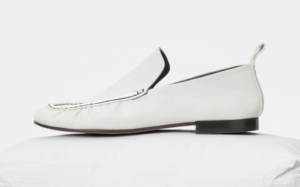 Hand-stitched and devised of lambkin leather, the quality and comfort of this shoe is unmatched. 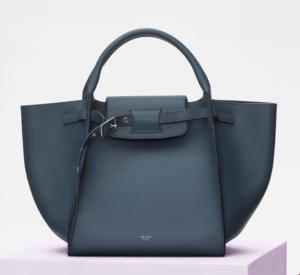 The online USA CÉLINE store has by far the largest range of CÉLINE products in the world. The USA CÉLINE online store unfortunately does not offer international shipping. Not to worry though! Big Apple Buddy, your personal shopper, can help you buy products from the USA CÉLINE online store and ship them to your doorstep, no matter where you are in the world. We offer international shipping to over 110 countries including Australia, Austria, Azerbaijan, Bahrain, Belgium, British Virgin Islands, Brunei, Bulgaria, Canada, Chile, Costa Rica, Croatia, Czech Republic, Denmark, Estonia, Fiji, Finland, France, French Polynesia, Germany, Gibraltar, Greece, Greenland, Hong Kong, Hungary, Iceland, Indonesia, Ireland, Israel, Italy, Japan, Jordan, Kuwait, Latvia, Liechtenstein, Lithuania, Luxembourg, Macau, Malaysia, Maldives, Malta, Marshall Islands, Mauritius, Monaco, the Netherlands, Netherland Antilles, New Zealand, Norway, Oman, Poland, Qatar, Romania, San Marino, Saudi Arabia, Serbia and Montenegro, Seychelles, Singapore, Slovak Republic, Slovenia, Spain, South Africa, St. Lucia, Sweden, Switzerland, Taiwan, Thailand, the UAE, the UK, Vatican City, and Vietnam. If you would like to buy from the USA CÉLINE online store, simply let us know which items you would like to order (by filling out the form below) and we’ll get back to you with a free international shipping quote within 24 hours!